Lawrence Technological University’s Net Zero Energy project with the Sampson Webber Leadership Academy in Detroit involves many stakeholders. 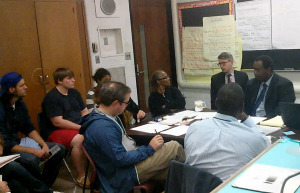 Here LTU students, at left, meet with school officials and community partners. Two student projects at Lawrence Technological University have won $25,000 Ford College Community Challenge (Ford C3) grants that promote sustainability and innovation. In all, the Ford Motor Company Fund, the philanthropic arm of the Ford Motor Company, is awarding $280,000 in Ford C3 grants to 16 student-led projects focused on building sustainable communities. The program, which is now in its seventh year, includes international projects in Brazil and China for the first time. The Ford C3 grant winners have presented proposals for sustainable projects with significant student input, involvement and leadership. Water conservation, renewable energy, urban gardening, recycling and transportation are among the proposals submitted by these creative teams of students. LTU is the only university with two Ford C3 grants this year. 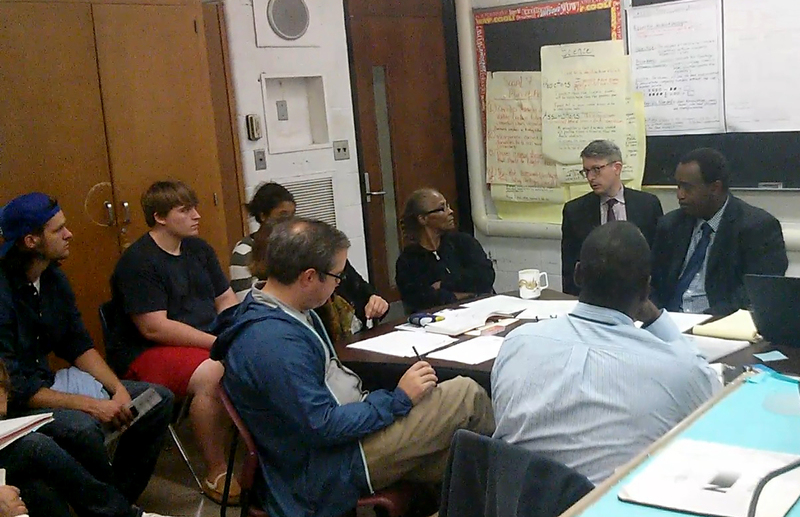 A team of 16 LTU students is partnering with the Detroit Public Schools (DPS) to design and build a Net Zero Energy (NZE) prototype structure with photovoltaic energy and rainwater collection infrastructure to be part of an outdoor classroom with an energy farm and instructional garden at the Sampson-Webber Academy, a public school in the Tireman neighborhood of Detroit. The student project will be coordinated through studio [Ci] in LTU’s College of Architecture and Design. The project is designed to be a prototype for other DPS schools to generate renewable energy, conserve water and reinforce sustainability lesson plans that educate children and train community members. “studio [Ci]’s transdisciplinary approach will incorporate “hands-on” involvement, education and training into a project that allows students, teachers and community members to engage in and be empowered by this New Zero Energy project,” said LTU Associate Professor Constance Bodurow, director of studio [Ci] and the faculty advisor. 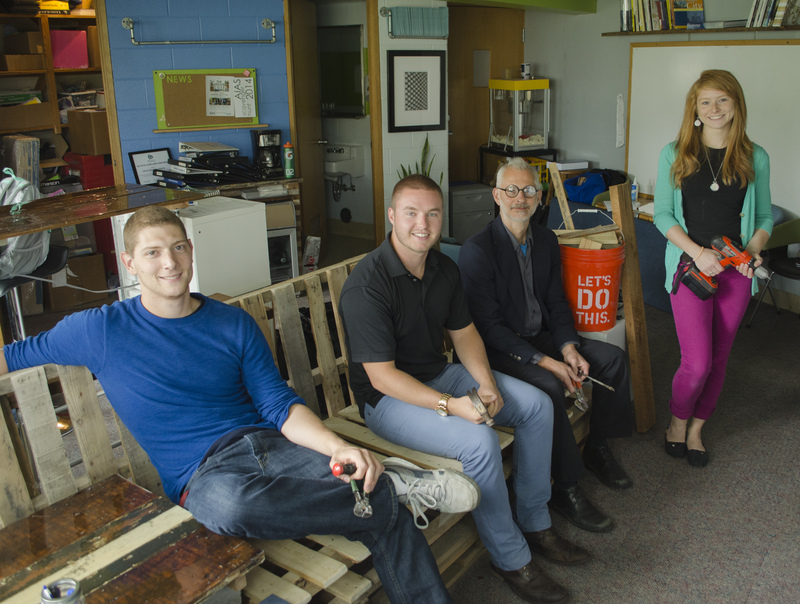 Students at Lawrence Technological University will deconstruct a vacant building in Detroit and design a new building with the materials reclaimed from the old structure. Pioneer Material Renewal team members include (L-R) Mike Paciero, Charlie Harris, faculty advisor Ralph Nelson and Meaghan Markiewicz. Missing from the photo is Drew Bradford. Another group of students in LTU’s College of Architecture and Design is tackling “Pioneer Material Renewal,” a project to deconstruct a dilapidated Detroit building, implement a standard assessment of the salvaged material, conduct tests for viable re-use, and design a new building for public use to be constructed with the salvaged materials. A team of five Lawrence Tech students is partnering with the RecoveryPark on Detroit’s east side and Architectural Salvage Warehouse Detroit and will seek to engage the community. 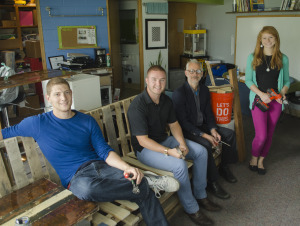 “The project builds on the spirit and principles of the urban pioneers who are rebuilding the city and working creatively with a minimum of resources and materials at hand to achieve a maximum effect,” said LTU Associate Professor Ralph Nelson, the faculty advisor for the project.